Hello, friends of the craft, how are your works. I was organizing with new plans for this year and I had several ideas. I started writing my personal goals, professional goals, goals for the site anyway ... and in that I realized that I need to do many different standards to improve and also that I need to look for new things and study more, after all I love what I do and to be better it is necessary to seek knowledge. That's why I leave tips for you, I always stop and think about your goals, if you do not have goals I'll make yours in your notebook because we need this to get what we want. I want to bring more different things to you, to learn more knowledge and practice, I always say this, you have to practice what you love with will and always think big and you will always be able to do better. So not only in the crafts but in everything that is to do. With that, I brought a different pattern to you that is on the rise and many people who are doing are loving the result. 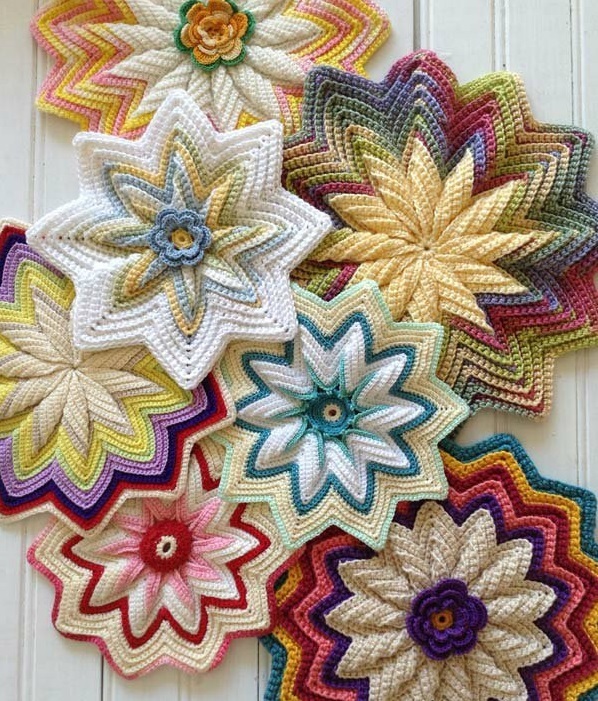 I bring in this post for you a different and very beautiful pattern that is the pattern called Flower Hot Pad of crochet that is simply perfect to decorate your house mainly your kitchen. This work is one of the types of accessories that exist to decorate your home. Because every different detail in your home makes the difference in your decor and makes it even more beautiful and unique which is very important. 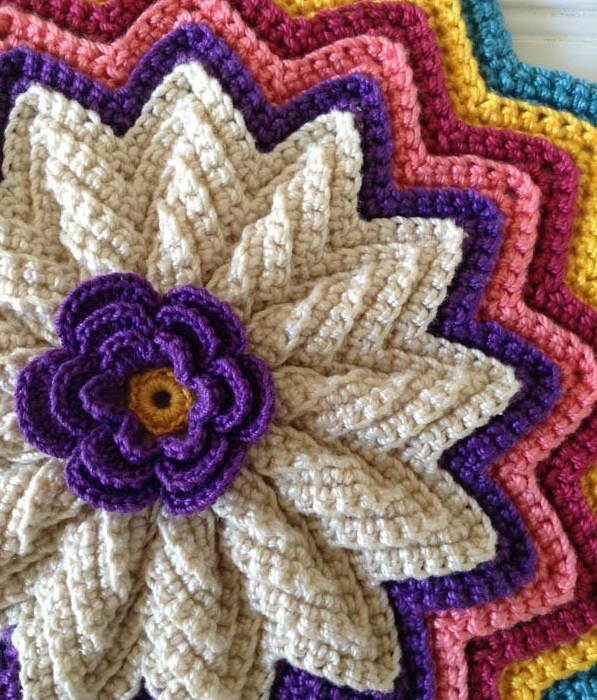 A great tip to use with this pattern is making crochet cushion covers, it looks great with this pattern because of its designer looks like 3D. One can do many beautiful works I will leave as an example what I talked about the cushion cover and also to hang in your kitchen or used to decorate your dining table. Everything that is done again of the difference in the house. When it comes to decoration, every effort is worth it because a cozy room or decorated rooms is very nice and changing accessories changes the style so this would be a good choice even more being crochet than we both loved. 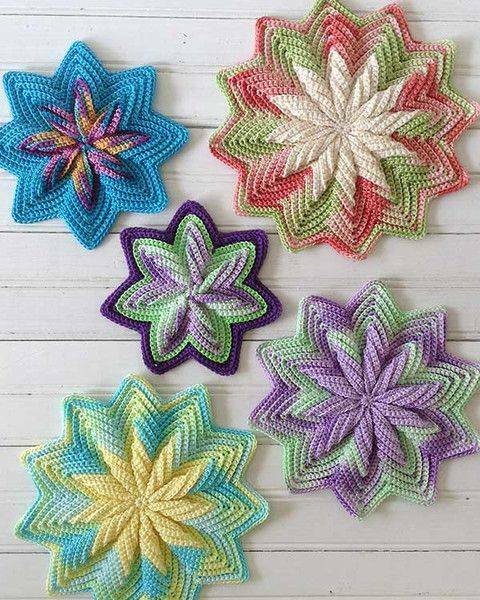 Make colorful crochet cushions to give a cheerful air, summer and also bring elegance and style to use. One of my favorite pieces of winter are the ones where we can make hot food and it's the moment when we need cookie pickers and this pattern is very useful for this too. And still bringing delicacy and joy to the table. Encourage everyone with this incredible pattern, make dinner and use to receive family and friends, I'm sure will delight everyone with this incredible patter. Uses crochet hook size "G"
For many years the crochet had its place, I gave a fall but now this super high and very accepted, being present in several pieces. You can use the color you want and prefer, and even match your decor. This crochet flower pattern is simply one of the most creative crochet designs I have ever seen. One should pay close attention to each point made according to the instructions as it is detailed but in the end compensates. This pattern is intermediate level. If you were looking for something amazing to be enchanted with here is this one, a very sophisticated pattern that leaves people impressed with the result and can also be created in several different styles. If you liked do not waste time, below I left the link with the step by step free and that you can print if you prefer. Enjoy our page on facebook Xell Crafts, good work and until the next pattern. This pattern is available as a free download ! !